Autumn has arrived and here at The Liberty we’re thinking about preparing our homes for the chillier months ahead. When it comes to getting cosy, what better room in the home to start with than the bedroom? 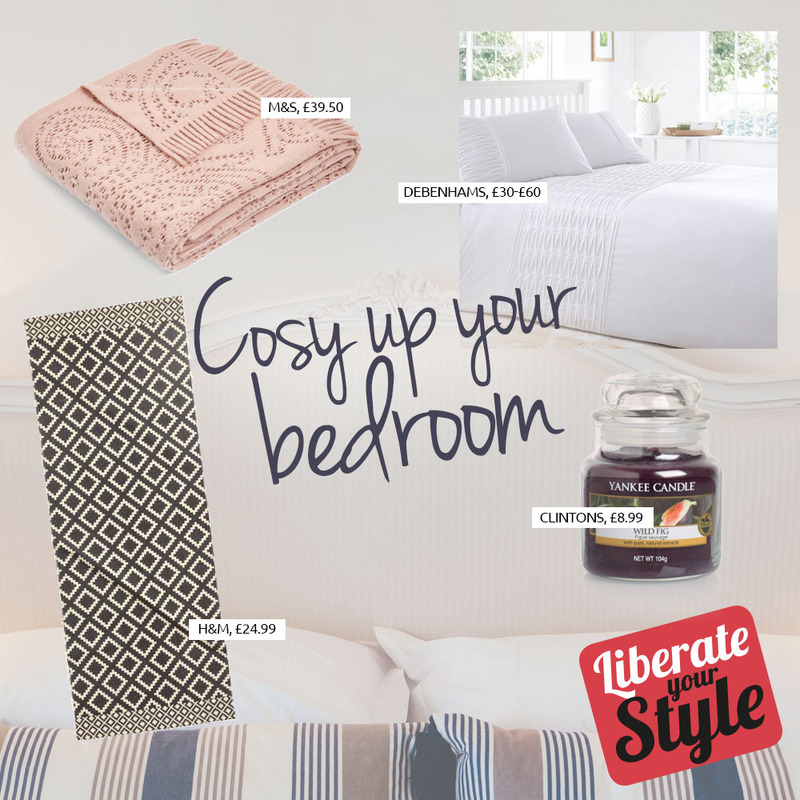 The Liberty has everything you need to create a space that’s tranquil, calm and cosy. From bedding to accessories, we can help you make sure your boudoir is a warm, blissful haven for when the cold nights set in. When revamping your bedroom, your ben linen is the quickest and easiest update. We suggest picking a crisp white set, such as this white pleated ‘Tibet’ bedding set (£40) from Debenhams as the foundation of your toasty bedding collection. This can then be paired with other throws and cushions in vibrant shades, to create warmth for winter. The best way to keep snug is to layer your bedding. Start with the ‘Woven Mia Throw’ (£39.50) from Marks & Spencer. This pastel throw comes in three shades and will add a layer of warmth to your bed as well as adding colour. The Liberty top tip: Layer your bed with 3 or 4 various textures and colours for maximum impact. We recommend using a light, medium and dark shade such as lilac, medium purple and deep purple to create a cosy ambiance. Rugs are a great way to create comfort within the home. Why not treat your toes to this Patterned Cotton Rug (£24.99) from H&M Home. The Aztec print is contemporary yet homely, and the rectangular shape makes it ideal for at the side of a bed, or at the centre of your room. A flicker of light can add warmth to any area. Try this Yankee Candle in ‘Wild Fig’ (£8.99); this scent contains natural extracts creating an Autumnal, comforting aura. The Liberty top tip: As well as candles, why not add a splash of herbal oil such as lavender and chamomile to your pillow before you go to bed? These scents are both relaxing and can even help you to get a good night’s sleep.